Here is a picture from the awards ceremony that took place prior to the Bruins game on February 28th 2019. The Hingham Harbormoms Learn to Play hockey program has been a wonderful asset to the sport. 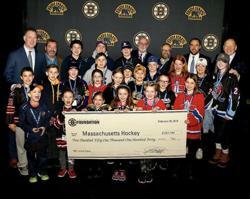 Bruce Haas, their coach, wrote to Massachusetts Hockey and the Bruins Foundation to apply for a Cheever grant which would offer a four session Women’s Learn to Play Hockey for Free program for women over age 18 who are interested in improving skating skills and learning to play the game. We are proud to announce that the grant was AWARDED! Stay tuned for more details on this upcoming program.